Get Dr. Chauncey Crandall’s latest updates delivered to your inbox. We never share your email address with third parties. Chauncey W. Crandall, M.D., F.A.C.C., is editor of the popular Dr. Crandall’s Heart Health Report from Newsmax.com. Dr. Crandall is a renowned cardiologist and is chief of the Cardiac Transplant Program at the Palm Beach Cardiovascular Clinic, where he practices interventional, vascular, and transplant cardiology. And because of his success in treating people with heart disease, Newsmax.com is honored to have Dr. Crandall serve as editor of Dr. Crandall’s Heart Health Report. Start your FREE 3-month trial subscription to Dr. Crandall’s Heart Health Report now and you’ll also receive a FREE special report! 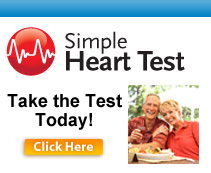 Disclaimer: All information and results from the Simple Heart Test are for information purposes only. The information is not specific medical advice for any individual. The results received from taking the Simple Heart Test should not substitute medical advice from a health professional. If you have a heart problem or heart disease, speak to your doctor or a health professional immediately about your risk.